Celebrate a one-of-a-kind getaway in this stylish home with an enclosed yard and spacious amenities! 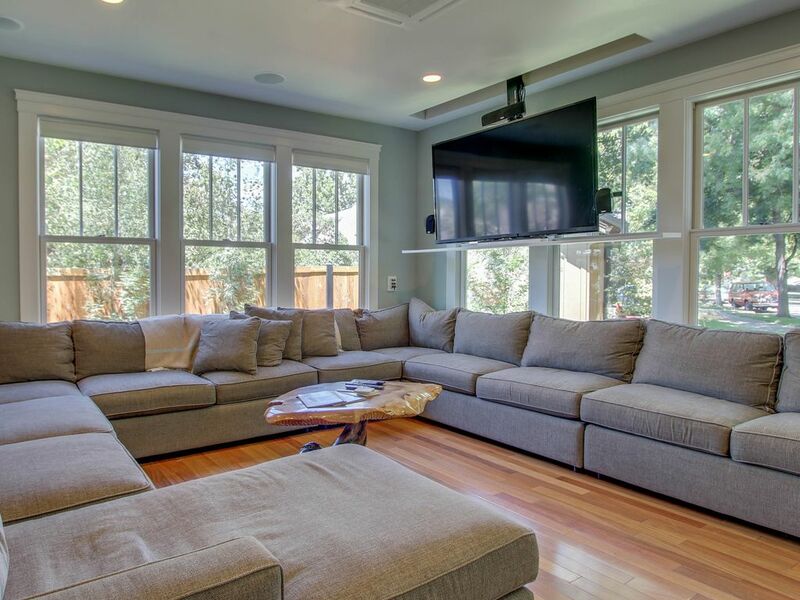 The rental is ideal for entertaining, just minutes to outdoor and urban attractions, with space for parties of 37 (with a maximum overnight occupancy of 10). Founder's Home is in Boise's historic North End on a dead end street. This private space is under a mile from the foothills and the downtown core! Built in 1902, the home was renovated in 2014 and offers a great room, gourmet kitchen, and basement game room. Convenience features like radiant hardwood floors, 12-zone surround sound throughout the entire home, a washer/dryer, and 7-zone AC will make everyone feel right at home. Media entertainment includes a 70-inch flatscreen TV with an electronic lift (a second TV is also in one of the the master suites), and WiFi. Host weekend tournaments in the game room complete with a Ping-Pong table and lounge chairs. The open-concept dining room and kitchen offers seating for 10 and stainless-steel appliances for easy meal prep. Founder's Home includes five bedrooms, four full baths, and one half bath to lodge up to 10 guests. There is a magnificent master suite with California king, luxurious private bath, and attached home office; two master suites with queen beds and private baths; a family suite with a double bed and twin trundle bed; and a sunny small bedroom tucked off the main floor with a twin-size daybed (please note the guest staying here will need to access a full bathroom via one of the other bedrooms). Have immediate family stay on site, but invite up to 37 guests to the family reunion, anniversary celebration, or business gathering! The enclosed back yard is comfortable and designed for entertaining with a shade cloth, large bistro table, and gas grill. The home is within a mile of Camel's Back Park and Military Reserve where you can spend afternoons hiking or mountain biking before heading into the foothills. Visit Julia Davis Park for major attractions like the Boise Art Museum, Idaho State Historical Museum, and Zoo Boise. Wander the up-and-coming districts and visit local boutiques, wine bars, brew pubs, and family-friendly eateries. You can have it all in this sophisticated Boise home. Entertain your guests in this great space and host the event they'll be talking about for ages! Parking Notes: Please note that parking is limited on this stretch of 7th Street. In order to keep the neighbors happy, please avoid parking more than 2 cars on 7th St closer than Union. Extra cars can be parked on Union St, or on 7th St on the far side of Union. Amazing home! Renovated, cozy and beautiful! This home was perfect for a business trip with my colleagues. It met all of our needs! Will stay again for sure! Beautiful house with plenty of space for our group of 8!! Loved the location in the north end of Boise. It was next to a park and 2 min walk to the Boise Co Op for food. The large sectional in the living room was perfect for visiting! The renovations are lovely but the historic character and charm of the house have been perserved! Nice home for large family gathering. Parking is challenging though. If neighbors arrive before you do, you may find no parking anywhere near the home. Convenient location to a variety of things to do. Quiet neighborhood. Everything we were looking for and more. our large group had lots of space and we were in easy walking distance to everything. the home is beautifully appointed. Every detail has been carefully considered. A true pleasure to spend there.